Orlando, Florida (CNN) -- Wearing a red and gold Gryffindor tie and wizard robes, 8-year old Barrett Brazelton waits his turn to enter Ollivanders wand shop in Hogsmeade Village. Barrett, of Olive Branch, Mississippi, hopes to see some magic behind Ollivanders' doors. And it's his lucky day. With the help of magic (and some state-of-the-art technology), a wand chooses him as its wizard match. The special effects impress the crowd, but the wand isn't actually a gift. To bring it home, you have to buy it. And sales are good at the park that houses Hogsmeade. Revenue from food, beverages and merchandise was up 29 percent at Universal Orlando's two theme parks in 2010 thanks in large part to Harry Potter's magic. The Wizarding World of Harry Potter started welcoming muggles (us non-magical folks) nine months ago. The attraction's opening in June inside the Islands of Adventure theme park helped boost overall paid admissions to Universal's Orlando parks by 20 percent in 2010 over 2009, according to financial documents filed with the Securities and Exchange Commission. 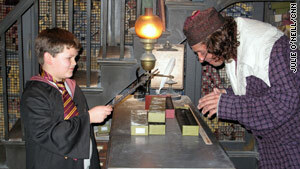 Barrett Brazelton, 8, looks for his perfect wand match in Ollivanders wand shop. It took five years to make author J.K. Rowling's fictional world a reality, according to Mark Woodbury, president of Universal Creative. "It's an entire world, shops, restaurants and attractions, that all speak to this wonderful body of fiction." The Harry Potter franchise includes 7 books that have sold more than 400 million copies worldwide and 7 films that have grossed $5.5 billion worldwide, with the final installment yet to be released. With the help of the film series' production designer Stuart Craig and art director Alan Gilmore, Universal Orlando wanted to create the next generation of theme parks, paying close attention to detail and using cutting-edge technology for three action-packed rides. The tangible playground begins at the archway into Hogsmeade Village, a celebrated photo spot where visitors gawk at this real-life interpretation. Designers took a greatest-hits approach to the park, creating a replica of the Hogwarts Express, Honeydukes sweet shop, Zonko's joke shop, Ollivanders, the Three Broomsticks, Hog's Head pub, Filch's Emporium of Confiscated Goods gift shop, and of course Hogwarts castle. Looming over the village, Hogwarts castle is two attractions in one -- a tour takes you through the halls of Hogwarts and ends at the park's marquee ride, Harry Potter and the Forbidden Journey. This ride reached its one millionth rider faster than any other attraction in Universal's history within a few months of opening. The interactive journey takes you through Headmaster Dumbledore's office, classrooms and the Gryffindor House common room. 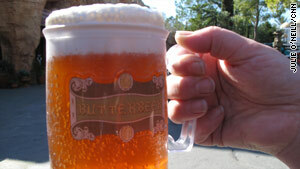 The park's popular Butterbeer received author J.K. Rowling's stamp of approval. "There are technologies that we employed here that have never been used before in this context. Sir Michael Gambon as Dumbledore appears in his office and invites you to enjoy the tour of Hogwarts. People come into this room and their jaw just drops open. They see Dumbledore, and he just starts talking to them," Woodbury said. The castle tour is actually the queue for the thrilling ride. So, walk slowly or you may miss some hidden gems. The intense ride combines sets and video screens that simulate flying alongside Harry and Ron over Hogwarts, into the Forbidden Forest, the Chamber of Secrets and through a Quidditch match. You'll encounter Dementors, giant spiders and even the notorious Whomping Willow tree. "You can believe the hype, this is a one-of-a-kind ride," says Gary Slade, publisher and editor of Amusement Today, a monthly trade publication for the amusement industry. "The transition between scenes is seamless. You are transformed from a movie where you're looking at action on a screen and the vehicle you're riding in swoops you down into the reality of a man-made room and then back again to the film projection technology." But what if you're not a Harry Potter fan? Words like muggles, Butterbeer, Quidditch and Dementors probably sound like gibberish. Can the uninitiated still have fun in a theme park devoted to the boy wizard's world? Yes, according to visitor Shana Bowes. Bowes admitted her interest in Universal Orlando's park didn't include the Wizarding World, but at the urging of friends she tagged along. "I only read half of a book. I didn't know the story, but was totally transported in the town and felt like I was there. To be honest with you, it makes me want to read the books now," Bowes said. "I never thought in my lifetime, I would see Universal's Spiderman ride outdone. It wasn't like others immediately countered with their version of the Spiderman technology. It was Universal who reinvented their own success with the opening of Harry Potter and the Forbidden Journey," Slade said. "They not only hit a home run, they hit a grand slam when they put this attraction in. It has a long life ahead of it because you don't get bored." While the Wizarding World of Harry Potter is only one section of Universal Orlando, it was by far the most crowded area in the entire park during a recent visit. The announcement that Blackstone Group, co-owner of Universal Orlando, is looking to sell its stake in the resort may risk the rights to the Harry Potter license, according to the Orlando Sentinel. NBCUniversal said it is studying the proposal. Despite behind-the-scenes uncertainty, travel operators from around the world are reporting strong demand for Orlando since the new attraction opened, according to Gary Sain, president of Orlando's Convention & Visitors Bureau. "We are confident that the attraction and the destination's other new offerings will continue to bring in new business for years to come," Sain said. The Wizarding World of Harry is a culmination of both the chaotic and classic events from the Harry Potter series, with ground-breaking rides and merchandise and concessions that seem to be a hit with guests. But can this part of the park that is so pointedly tied to a franchise, with no upcoming books and only one film left to be released, maintain crowds while continuing to boost Universal Orlando's relevance? Universal isn't concerned. "It's a modern-day classic. If you grew up with Potter, reading the books, watching the films, you're at the point now where you're starting to think about sharing that with your child, or soon will be," said Tom Schroder Universal Orlando's vice president of corporate affairs. "The stories of Harry Potter have become a generational thing that gets passed down, and I think with that the popularity of the Wizarding World will only continue to grow."